The craze for kids' bead projects. To see other Channukah crafts, Jewish holiday and fun sites: see Eileen's Camp Crafts and Other Fun Things - Site Index. See my BEADIE PAGE for basic instructions. 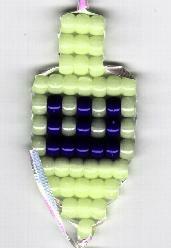 Also see my Bible and Jewish Holiday Bead Projects Page for more designs. We love the new mini pony beads. The Blue, green, and yellow dreidel uses 33 beads. The other 31 beads. This driedel also started to glow when put into the scanner! We made this with full size pony beads but this would also work with the mini beads. Make it any color you want! 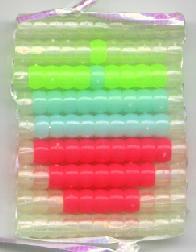 40 Glow in the Dark Beads. To see a great diagram with arrow directions on how to do my bead pattern see Eileen's Dreidel at MakingFriends.com. This dreidel is a great beginner one if you make it in different colors. Because of the even rows, this one is only a beginner to medium level project. We did the glow in the dark mini beads for fun. If this is done in full size beads it will be very large. 51 White glow in the dark beads. 9 Yellow glow in the dark beads for the flames. 19 Blue glow in the dark beads for the candles. 21 Pink/salmon(?) Glow in the dark beads for the Mennorah.